“Everything works, whether it is water, electricity or telexes and if it doesn’t, I want to know why and if I am not satisfied, which I often am not, the chief goes”. Response:like this Grandma statement made famous by Senior Lee. When he was squatting on the Imperial Throne, no one I say again no one dares to fu*k around with him. WHY? It’s because he is the ONE & ONLY Indian Chief around. Whenever Big National Problems or Issues had arisen, he stood up and FACE them squarely, solved and resolved them ASAP! How about NOW? Yes, we do have an Indian Chief BUT a limbek one (soft like a Chee Cheong Fun) and few self-proclaimed Little Indian Chiefs to absorb most of the Heat and Blame whenever there are Big National Problems and Issues occuring. And most of the times, he is hiding under a skirt….popping his Head out ONLY when everything is solved or resolved! And also he spends a lot of his precious time plotting to FIX and FINISH off the Opposition! « Singapore, a nation that have no proper control of exploitation of foreign workers. The LEEga$y of WHATS WRONG WITH COLLECTING MORE MONEY has gradually destroy the nation. More *HAPPY AGEING* elderly sgs will COLLECT CARDBOARD LITTERS as a form of excercise. @Bapak; Allow me to make some correction here; There was no Little Indian Chief, it was the little Indians who absorbed most of the heat and blame. “hiding under the skirt” is right but he popped up his head some where else like nothing had happened and pretended that everything was solved. He not only “.. he spends a lot of his precious time plotting to FIX and FINISH off the Opposition!” but also thinking ways and means of sucking the money from citizens. Schemes after schemes, scam after scam. I have this feeling that he doesn’t care the least of what’s happening and the government is on auto-pilot. This country is now operated on COIs. You must be saying about our dear Li Hsien Tau ?? ?…or also better known as Li Hsien Loot ? He was and absolute dictator who thought overly great of himself like as if e was perfect in all aspects. That was when he was not sure he would be re-elected, there were many good oppo in those days – that people could turn to\. After he became all-powerful he didn’t give sh*t what happened to us. F…him and thank God he is DEAD!!! Do you now clearly observe for yourselves, the hard truth of the FAILURES of “Lee Con You” 1-man rule system? Basically, there is no independent institutional oversight nor framework of governance. Everything depends on the modality of the 1 person sitting on the throne. Such a system is a Dictatorship. It is not a meaningful democracy (defined as rule by the people) nor even a properly functioning modern society. Everything works if the Supreme LEEder is wise and effective, but unfortunately that Supreme LEEder is not a God, but a mere mortal. So once the Supreme LEEder passes away, EVERYTHING breaks down, and especially so when you get a Supreme Fool at the helm. That is why Western civilizations invented Democratic systems and institutions to outlast the individual and avoid the need for an Emperor-style ruler. This is a social invention to sustain modern technological society which is too complex for any 1-man to comprehend, no matter how brilliant. I would theorize that this institutional invention by Western cultures is what enabled them to make their great technological leap forwards and supersede the archaic Chinese civilization (which was based on rule by dynastic Emperors and their progeny) over the past 250 years. Even today, Communist China is still steeped in favor of 1-man absolute rule which is a throwback to their old structure albeit masked in more contemporary political party ideologues. Singapore may have progressed in terms of material wealth but in my view, all this is just a mirage and we are actually regressing backwards over the past 50 years under the relentless (and ultimately self-defeating) manipulations of that nasty ‘Lee Con You’. In his quest for absolute power over his little island domain, he consolidated all independent institutions under his control, from fixing the opposition, to workers unions (aka NTUC), to media propaganda, to the makings of a “c0m-pliant” judiciary. the entire system of government and nationhood was intentionally confabulated with his political party. See the striking similarities with the current Chinese Communist Party thoroughly mixing the State with party agendas? Such is the leanings of the regressed Asian mind to pander for a singular Emperor to make all the decisions for them. Thus, the deterioration at many levels of various institutions that were handed down to us by the British post-independence. All these were not immediately apparent as the aura of “Lee Con You” managed to outshine all the cracks within the system…for some time. Outwardly, things seem Ok as long as a powerful Supreme LEEder is around to keep his flock in check; but once he is gone, everything falls apart. He installed the little prince and the root of greed in government. He destroyed his own leegacy. You see how people are comparing the father PM with the son PM, what a world of difference when it comes to doing things and beingtough on people. True, Kayu may have been a real arrogant bast**d with his Graduate Mothers scheme and threat to Aljunied to repent but at least he was a no nonsense guy. When he wanted you dead you were as good as dead, just ask all those opposition people he sued throughout the decades. At least when he was around there was the fear of losing your job should something major happen. We all know that Kayu’s way of doing things he would have chopped off horse face Mah and Wong Can’t Sing over their lapses. Gan and Ng would be roadside sweepers today already. We need another no nonsense guy, not a worse than useless pansy masquerading as PM! So much for the widely emphasized meritocracy where the able and talented individuals are not recognised and promoted while the mostly mediocre is at the helm. This is the norm of the society. Selfish Sinkie Syndrome: Basically, there is no independent institutional oversight nor framework of governance. Everything depends on the modality of the 1 person sitting on the throne. Such a system is a Dictatorship. It is not a meaningful democracy (defined as rule by the people) nor even a properly functioning modern society. Well-scripted, but these events don’t happen in a vacuum. A necessary lubricant to facilitate the slide to dictatorship is the passivity or collaboration of its’ citizens. Singaporeans are taught in schools and trained to obey to serve since young. When you finally get the opportunity to chose your own path you realize there’s no where to go. History if full of Empires that failed. ie, ALL empires fail , Eg. The Roman , The British , The Spanish , the Mayan , several Chinese , Persian , Alexander`s , the Moguls of India , Aztec , Inca , Assyrian , etc , etc). Now we are in a far more dangerous spot, and the vaunted “separation of powers” is truly failing us. I wouldn’t trust this administration to find its way out of a paper bag much less finding and executing a coherent strategy on how to maintain a vital presence in the world of diplomacy or in averting a war with our neighbor. At this point, does it even make sense to speak of “international trade”? Let us not forget that the current system of PAP government was put in place by LKY. By that I mean choosing scholars and paying them humongous salaries to basically ‘buy’ their loyalty. LKY knew that money could be used as a means of control over his party members. So he pushed salaries as high as he could claiming he cabinet members were as good as any in the private sector. 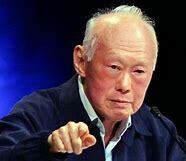 The current rot in the PAP must be attributed to LKY’s obsessive need for absolute control over Singapore by any means necessary. Sometimes when it comes to leadership succession, an organization makes a wrong choice and subsequently takes a step or two backwards. Until somebody within the organization says enough is enough. He decides to boldly go where no one has been before. He charts a new course. He dispenses with old outdated sacred cows and cronies. He introduces new ideas and solutions. We are not seeing this with the PAP. Look at it this way. If LKY was a giant among men, GCT was at best mediocre. By comparison, LHL is a dwarf surrounded by a band of merry midgets. In other words, the party is regressing. They say the apple does not fall far from the tree. In the case of the Lee family, the apple has not only fallen far but rolled down a hill and landed in a gutter. Why ah gong dare to call Singaporeans DAFTS? There are about 70% have already proven that ah gong’s observation is 100% accurate. In the coming GE, we will know the new percentage of DAFTS. Why would you think MIWs want to hear from DAFTS when they brand themselves as ELITES. Please wake up. Most of the problems now can be traced back to the worshipped one. Please stop the blind worshipping. Just a caution when quoting the Late LKY on his ‘no-nonsense’ way. Note that he just said ‘the chief’. He did not says political chiefs. Now you know better, I hope. LEE KAYU sons are at each other’s throats.Mei Hum did not even invite little brother and sister for reunion dinner.He is going after little brother’s son and wife.Every family has problems but no many will wash dirty linen in public,not let the whole world know that LEE KAYU brought up a SCREWED UP FAMILY,and was a FAILURE as a FATHER FIGURE.THAT IS THE HARD TRUTH. It is a blessing in disguise that LEE KAYU is dead anD is not RISING FROM HIS GRAVE as promise by him.If he were even to rise from his grave he will immediately return back from were he came after seeing the conditionS now.THIS IS THE HARD TRUTH. His biggest failure is to have built a nation without opposition such that when pap fails, the country collapse. This is not a democratic system. What he built is an authoritarian regime. I cannot see the rationale of mass import low quality and productivity workers from third world especially professionals from India that actually put the economy on risk. No thanks to CECA initiated by GCT – it must be stopped. SPOT ON, MATE. Staggering evidence staring in our face in reality. Economy commit suicide: I cannot see the rationale of mass import low quality and productivity workers from third world especially professionals from India that actually put the economy on risk. No thanks to CECA initiated by GCT – it must be stopped. Our population recycling economic model is flawed and WAY UNDERPERFORMING. The GDP numbers over time prove that. Population growth creates demand and consumption along with investment in housing and infrastructure. If the population base grows by 5% per annum, the GDP growth must keep pace of 5% per annum at least. And in LEE-jiapore this is NOT happening – meaning the economy driven by massive population influx is generating a rate of economic activity as measured by annual GDP growth is WAY BELOW SUB-PAR of DIMINISHING RETURN. And when you add in and factor in technology changes adding to productivity growth of processes, the rate of GDP GROWTH in LEE-jiapore must significantly exceed its population growth pace. Is this happening? The numbers in GDP growth in the last 10 years DON’T SEEM to me barely keep pace with the size of its population size expansion. ON THE CONTRARY IT IS LAGGING FAR BEHIND. Or am I see the wrong economic statistics? PRESENT TENSE TOLD THE NATION IN 2015 that our economy has MAXED OUT – this is IN SPITE OF 10 YEARS OF OPENING THE FOREIGN POPULATION FLOODGATE HAPPENING. In 2016, he told the nation that restructuring has failed, that is why still so much pain in the community. In 2017, his NDR speech talked of only diabetes (I would have preferred if he had spoke of that diabetic state of our economy instead) and how to turn that around of either abandoning his population recycling economic model or cut out CECA and other gimmicky free trade deals which did nothing to add to our economic prosperity. SO IT BEWILDERS ME WHY SO MANY SINKIES ARE STILL OBSESSED WITH PROPERTY in an economy that is clearly sinking and failing – irreversible – unless PAPpys changes its economic model construct. 4Gs are CONSPICUOUSLY DIAM DIAM DIAM on the state of our economy and how to turn that around. @ Economy commit suicide, on balance I agree with your observations.